Do you love the flavors of French Onion Soup Dip? For me when I was growing up my Mom would often throw cocktail parties if you were doing in this the late 70s you were serving up French onion dip and chips. As an adult, I have often been known to serve this up at a party. Here is an updated version of the French onion dip. is a handy size that you can take to work, or you can use it at parties. I like this size, it is small. 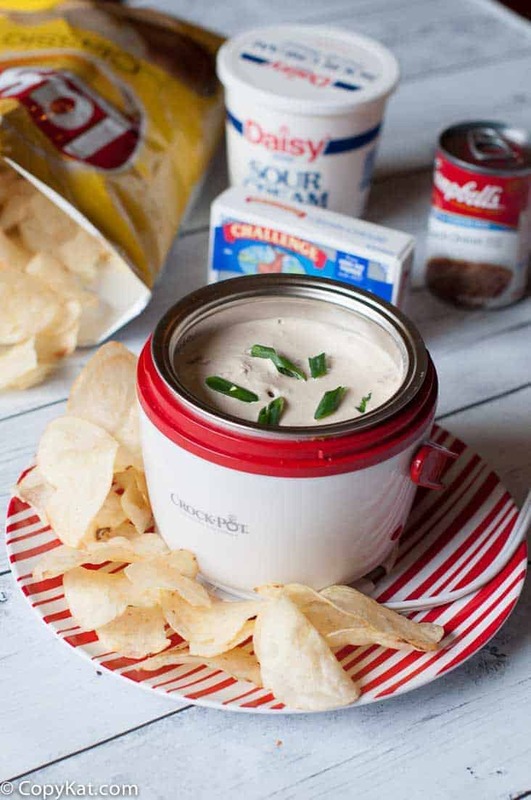 So I often use mine to take some hot cheese dip or this dip to a party. This French Onion Soup Dip tastes great whether it is hot or cold. I have eaten and served it both ways. If you like you can add Parmesan cheese to this recipe for variety. When I add the Parmesan cheese I like to serve the dip warm. Either way, you serve this recipe, I know you will enjoy this dip. Perfect for a game night or tailgating, you are going to love this easy to make Hot Onion French dip. In a small saucepan over medium-low heat add cream cheese, sour cream, and French Onion soup. Stir until heated and well blended. To serve pour into a small slow cooker, or serve in a bowl. Garnish with chopped green onions if desired. Hey Stephanie, Thank you for all your recipes and I wonder if you have one for the Spinach & Artichoke dip @ Applebees ? Stephanie, I would love to try more recipes, but I would like to request nutritional information. I’m a type 1 diabetic, I can go off-menu at times, and just like to know how many grams of carbs, protein, fat, etc. so I can adjust my insulin pump to deliver the proper dose. Thanks. Thank you for that suggestion, I am trying to go back and update old recipes as I can. I have updated the nutritional information. I love french onion soup and I bet I would really like it in dip form. I also like how this is so easy to make! This is very tasty, I hope you give this a try. I love a recipe like this for when I am busy and trying to get a party together.